This project investigates the use of metaphor in the experience of end-of-life care in the UK. It involves a systematic analysis of the metaphors used by members of different stakeholder groups (patients, unpaid family carers and healthcare professionals) in a 1.5-million-word corpus consisting of interviews and contributions to online fora. In addition, we will address the implications of our findings for existing descriptions and theories of metaphor as a linguistic and cognitive phenomenon. The method that will be employed to identify and analyse metaphor in the data is both qualitative and quantitative, including the use of the semantic annotation tool within the online software tool Wmatrix. The findings of the project will be of benefit to health professionals, carers and patients alike. 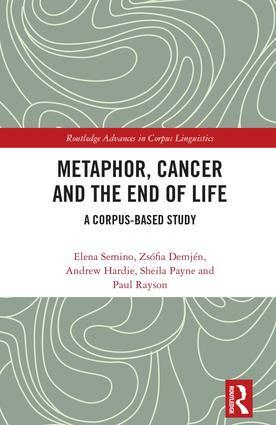 December 2017: Our book "Metaphor, Cancer and the End of Life: A Corpus-Based Study" has been published by Routledge. January 2016: The European Association of Palliative Care (EAPC) has re-posted our blog entry "'Good' and 'bad' deaths in interviews with hospice managers" as it is one of their all-time most popular posts. December 2015: Our blog post about "Laughing at Cancer: Humorous metaphors online" appeared on the European Association for Palliative Care website. December 2015: Our BMJ Supportive & Palliative Care paper (DOI: 10.1136/bmjspcare-2014-000785) is the second most read paper in the journal between December 2014 and November 2015. September 2015: Elena Semino's talk at Cancer Research UK has appeared on their science blog. September 2015: We are collaborating with the Metaphors in palliative cancer care project at Linnaeus University in Sweden which is using the MELC metholodogy. August 2015: Our latest paper has appeared in International Journal of Corpus Linguistics, see our publications page. March 2015: Our latest paper has appeared in BMJ Supportive & Palliative Care, see our publications page. This page last modified on Thursday 7 December 2017 at 11:48 am .